While metal bodies are typical of many kinds of tea canisters, Ryu-Mei likes to take it one step further and turn the core material into an art form in and of itself! Adorned with elegant printed designs and a traditional Japanese flair, these tea canisters are as effective at bringing style to a room as they are at keeping your tea fresh. Examples of our metal canisters include our Hana Shukanoen and Kouetsu styles. Do you live next door to me? 'Cause that was some crazy fast shipping! 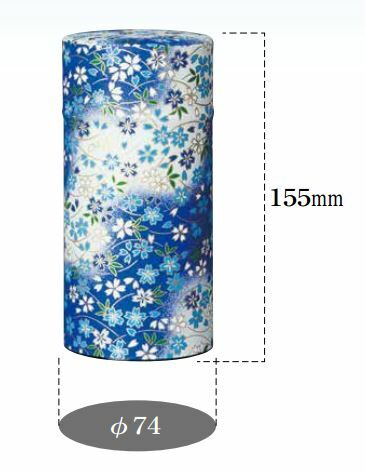 Pretty canister and very attractive price, with quick delivery. Thank you. Tea tins are beautiful. They were packed and protected very well. Received the shipment ahead of time. Will definitely use this vendor again. VERY GOOD ITEM, THX, I WILL VISIT UR SHOP AGAIN! Thank you-a pleasure to have dealings with.